Nearly five years on from the murder of Anni Dewani, her family have told ITV News they'll keep fighting to uncover exactly what happened. Dewani "Evidence of liars led to witch hunt against me"
Shrien Dewani, the Bristol businessman cleared of arranging his wife's murder, broke his silence today for the first time since he walked free from court. It came in a letter to the coroner who was asked by Anni Dewani's family - and refused - to re-open the inquest into her death. I would like to make clear that I have a significant number of questions which remain unanswered about the night that my wife and I were kidnapped and Anni was tragically shot after being taken away from me. Each of the gang members did a deal with the authorities to gain either full immunity or vastly reduced sentences in return for providing evidence against me. It is the evidence of these proven liars that led to a witch hunt against me and the resulting failure to pursue the truth of what happened that night. It is clear that none of the evidence provided by these persons was corroborated in any meaningful way. This has allowed the individuals concerned to literally get away with murder. A coroner has questioned whether a UK-based inquest into the death of Anni Dewani should go ahead. A book written by the father of Anni Dewani - the 28 year old who was killed whilst on honeymoon in South Africa - is being released today. Vinod Hindocha says he wants Anni's husband Shrien to tell him what really happened. The Bristol businessman was accused of arranging her murder but the case was thrown out before he took the stand. Bristol businessman Shrien Dewani may have to give evidence for the first time as it emerged that a UK coroner is "working towards a hearing date" for the case of honeymoon murder victim Anni Dewani. Mr Dewani, a care home tycoon, was cleared by a South African judge of arranging his new wife's death. He was free to return home to the UK after Cape Town Judge Jeanette Traverso dismissed the case against him, describing evidence from a key prosecution witness as being "riddled with contradictions". He has never spoken publicly about his wife's death, but that could be set to change if an inquest into her death goes ahead. The coroner is in contact with the parties working towards a hearing date for this matter. A formal complaint has been lodged against the judge who presided over the murder trial of British businessman Shrien Dewani in South Africa last year. The Higher Education Transformation Network - a group of academics and lawyers - accused Judge Jeanette Traverso of "gross judicial bias and misconduct" after she dismissed claims Mr Dewani organised the murder of his wife Anni while on their honeymoon in Cape Town in 2010. The judge called a halt to the trial in December, two months into the hearing, after an application from the 34-year-old's lawyers that the prosecution case was flawed. HETN chairman Lucky Thekisho said: "Article five of the Judicial Code of Ethics requires judges to act honourably not only in the discharge of official duties but to act honourably and in a manner befitting judicial office in a professional manner that enhances the public trust in or respect for the judiciary and the judicial system." Lawyer Mr Thekisho urged South African judicial authorities to suspend Judge Traverso pending an investigation. Ashok Hindocha, Anni Dewani's uncle, said: "We agree that Anni did not get a fair trial. "The case was not fully heard, she (judge Traverso) should have let Shrien take the stand." Extraditing cleared honeymoon murder suspect Shrien Dewani to face trial in South Africa cost the British taxpayer around £250,000, according to reports. A Freedom of Information (FOI) request by the Daily Mirror suggested the Crown Prosecution Service spent a total of £136,520 on QCs and junior counsel to argue the case in court, while a further £23,464 was spent on psychiatric assessments of the Bristol-based businessman. Mr Dewani, 34, fought a long UK court battle against extradition before being cleared of murdering his wife Anni who was shot dead in Cape Town during their honeymoon in South Africa in 2010. Three men already serving jail terms for their role in the killing claimed Mr Dewani arranged a hijacking-gone wrong in which he would survive and his wife would be killed, but a judge in South Africa ruled their evidence was flawed and the case was thrown out before he could give evidence. The Mirror also said FOI figures showed CPS solicitors spent 496 hours on the case, adding a further #34,000 to the public's bill, while police, transport and medical costs made the total around £250,000. Extraditing Shrien Dewani "cost £250,000"
The home of honeymoon murder suspect Shrien Dewani has been attacked by vandals, days after he was freed by a South African court. A large amount of white paint was splashed on the tarmac driveway outside the electronic gates of the £1.5 million villa in Bristol. The Dewani family have hired a private security firm, which has put up a sign warning that the property is being guarded and protected 24 hours a day. The paint appeared overnight after reporters spent all day waiting in vain for the return of the 34-year-old. He was dramatically cleared of arranging the murder of his wife Anni in 2010 and allowed to return to the UK on Wednesday. Dewani is believed to be staying in London before returning to his home in the Westbury-on-Trym area of Bristol. The big detached property, which is shielded from the road, is owned by his family, who run a care home empire in the West Country. Shrien Dewani had always denied plotting to arrange the murder of his wife, who was shot after their taxi was hijacked while the couple were on their honeymoon. But his wife's family are now threatening a private prosecution against him. 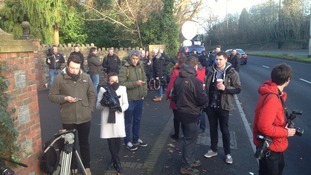 Journalists are camped outside Shrien Dewani's house in Bristol awaiting his return from South Africa. On Monday Judge Jeanette Traverso cleared Dewani of murder after ruling the prosecution case that the bisexual care home boss had arranged the death of his wife Anni was flawed. A woman who walked down the private drive from Mr Dewani's home in Westbury on Trym said: "I do know he's not coming today. Tomorrow ... I asked the family." Asked how Mr Dewani and his family were, the woman, who did not give her name, replied: "They are happy, happy." The millionaire businessman's home - called Prabhu Krupa Villa - is not clearly visible from the busy road connecting Bristol to the M5, where it is accessed through electric gates and a steep driveway. Former murder suspect Shrien Dewani has arrived back in the UK after being cleared of plotting his wife's death on their honeymoon in South Africa four years ago. He flew into Gatwick early this morning. 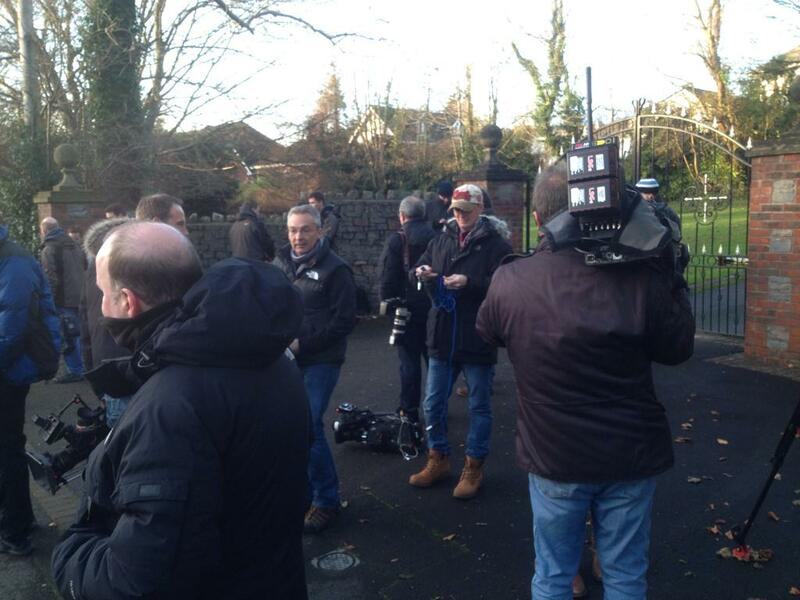 Media are camped outside his home in Bristol, awaiting his return. 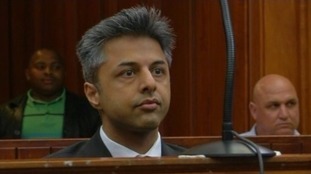 Mr Dewani was extradited to South Africa in April, having suffered from severe post-traumatic stress and depression. His trial began in October. But earlier this week at the Western Cape High Court, Judge Jeanette Traverso dismissed the case after criticising the quality of the prosecution's case.